Go look at i2imca on facebook. Last weekend I had the opportunity to take part in the final course of four with the i2i Motorcycle Academy. Each of the four courses uses techniques from road, off-road, supermoto and track motorcycle riding to teach participants how to work with their machine and to challenge the preconceptions we all have about what can be done and what can’t be done with a motorcycle. Known as MC1, MC2, MC3 and MC4 the courses build on each other to challenge you and your own machine, and also off-road and supermoto machines provided by i2imca. But a key technique of the instructors is to keep you in your comfort zone while doing this, so that at no time should you be put in danger of a panic situation. And another of their key principles is that they never demonstrate techniques that they haven’t (or won’t) show you how to do in their course. MC1 and MC3 are carried out on your own motorcycle and I did the two over a single weekend last year. This year I had opportunity to complete the other two courses, which also happen to use machines supplied by i2imca. This year in April I was introduced to off-road in MC2 and supermoto in MC4. As you can probably guess, all of the courses are conducted off public roads – this gives the instructors a sterile environment to take participants through the drills that build on each other through the course. Last year MC1 and MC3 took place at Tockwith, on an old WW2 airfield, MC2 was on an off-road track near Thirsk and MC4 took place on a section of the airfield at Rufforth. MC4 is billed as the course to “develop very advanced skills” and covers the extremes as they relate to braking, cornering, acceleration and cornering. To do this you bring in things learned in the earlier courses, and then try to figure out how they apply to a supermoto. If you’re not familiar with Supermoto, basically the bikes are motocross machines with different wheels and with the front brake changed. Road wheels and tyres are put on the machine, and a larger front brake added to be able to use the increased grip on the front wheel. Tom Killeen, director at i2imca, started the day by getting us kitted up in the mixture of styles that comes with supermoto – motocross boots and helmet, and our own road kit for jacket, pants and gloves. Then we had a look at the bike to figure out how to ride it. Is it a road bike or an off-road bike? It has the ground clearance of a motocross bike, which compared to road bike is huge. To illustrate a point, like he does throughout the course, Tom took one of the parked KTMs and showed us how far it could be tipped over which seemed to be almost horizontal. This began to show how suited supermoto machines are to this type of course – with their excellent ground clearance and long travel suspension they are ideally suited to exploring the “extremes” of machine control. We then had opportunity to learn the course which had been laid out in cones on the tarmac – a series of turns, jinks and even a double back had been added to make us apply the techniques we would learn – and then they added an off-road section in the afternoon! But even that was a lesson, as one group goes out the next group can watch and learn – where are they sitting? Do they move around? How do they move? Throughout the day the course takes one “story” or preconception at a time and challenges it or illustrates it. For instance, what happens under extreme braking? Does the front wheel skid? What happens with weight transfer? To show how much grip is available we practiced the technique from MC3, which combines use of the gyroscopic effect of the wheels with managing weight transfer to maximise grip and stability. Then we took it to the extreme by changing the braking technique slightly and we were doing stoppies! This went to show how much grip we had, and then we built on that by using the weight transfer of our bodies forward or back to work with acceleration or braking. And other important techniques built on these principles of using body weight transfer to work with the other forces and capabilities of the machine to rewrite the stories and misconceptions that come to us from all sorts of places. Countersteering was used, smoothness was emphasised and the inherent stability of a moving motorcycle reinforced. For me – a relative novice and the first time on a supermoto, it was a lot to take in, but Tom and his fellow instructors take things step by step and emphasise the basics – there is only so much you can take in at a time but these build and build and help all of us to be better and safer riders who can ride our machines better. 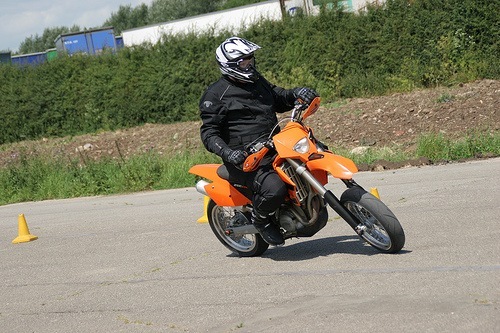 I thoroughly recommend the series of courses which fill a gap in the provision of machine control training for motorcycles, there are still riders who have ridden and ride thousands of miles a year that do not know how a motorcycle turns or that they can do anything about it apart from “lean” or others who struggle with braking hard. If you are willing to learn (and unlearn) then you will take a lot away from these courses. I like what Steve Marx has done over on his blog with an intro to Windows Azure – go look, its only 4 minutes long to watch his video.